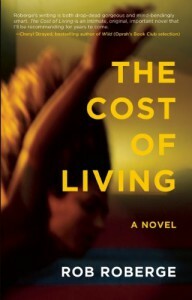 Click the image to watch my video reviewThe Cost of Living will easily make my top 10 of 2013 list.I've read all of Roberge’s work, all that I’m aware of (Drive [novel], More than they Could Chew [novel], Working Backwards from the Worst Moment of My Life [stories]) and I’d read anything else in the future. He’s one of my favorite writers, so you know, having the history I do, you can trust my words.To read The Cost of Living is to read the rock and roll story that everyone’s always wanted, but could never find; there’s too much glitter and groupies, too much ego in other rock and roll stories. With The Cost of Living, you’re forced to deal with, and ultimately fall in love with, a life that’s been destroyed by the stage. Every rock and roll story you've read before will seem cliche compared to The Cost of Living.